The San Francisco Symphony's last East Coast tour, in 2013, was canceled because of a strike by the musicians. Their last visit here, then, was in 2010, with an unusual program including obscure Liszt and Victor Kissine. Their appearance on Saturday afternoon, presented by Washington Performing Arts in the Kennedy Center Concert Hall, returned more to the feel of their 2006 tour, when they gave heady, refined interpretations of Debussy's Jeux and the Adagio from Mahler's tenth symphony. The new program, combining Schubert's eighth symphony and Mahler's Das Lied von der Erde, was a calculated tour de force, intended not to shock and awe by its force but to seduce by its subtlety. Music director Michael Tilson Thomas zealously watched over a most delicate rendition of the "Unfinished" Symphony, immediately hushing the low strings in the introduction to the first movement. With a restrained pace he took the tempo marking of “Allegro moderato” at face value, a moderation that extended into all musical areas. The cellos presented the famous B theme with consummate introspection, and after the development’s mysterious chords with rumbling bass, the recapitulation returned just as serenely, at precisely the same tempo as the one set at the outset. The second movement was just as rarefied, with the oboe solos striking just the right air of plangent longing, matched by strong contributions from clarinet, flute, and horn, all allowed to be limpid and graceful, never forced into shrillness. The “lean in” ethos Tilson Thomas was after continued in an extraordinary, disembodied reading of Mahler’s “Das Lied von der Erde,” or at least part of it. 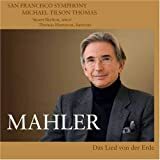 In his Mahler cycle with San Francisco, Tilson Thomas recorded this piece, which allowed Mahler sneakily to circumvent having to write a fateful ninth symphony, with baritone and tenor. The New Zealand-born tenor Simon O’Neill had some force on the extroverted tenor arias, perhaps too much, not quite focused enough in tone, and rushing in some of the songs. Mahler’s orchestration is symphonic and can feel merciless in the tenor pieces, requiring some storminess in the singer, which O’Neill had to a degree, with some strain on the top notes. If you are wondering why Tilson Thomas would trade out the baritone version of the cycle for the mezzo-soprano one, the answer could be that he had Sasha Cooke available. Tilson Thomas coaxed more exquisite sounds from the orchestra to envelop Cooke’s silky legato phrases, but under which she was never submerged. In “Von der Schönheit,” the orchestra turned on a dime, one minute floating ethereally, the next ranting through the interlude of boys galloping on their horses, and then sighing in the postlude with the yearning maiden. The sense of desolation in “Der Abschied” was overwhelming, the masterfully gloomy orchestration, the gorgeous flute and oboe solos. Oh, eternally Love-Life-drunk world indeed.